Easy Stroll will make poushing a stroller more comfortable, while allowing you to maneuver using just one arm. It is compatible with most non-umbrella style strollers, and the installation process is easy. It comes with 3 different sized rings to ensure a proper fit on a wide range of stroller models. Just select the one that best fits your stroller handle, and set aside the other two, as they will not be needed. 2 complete ring sets (8 ring halves) that will not be used. 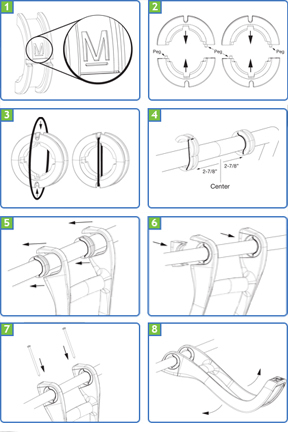 Follow the step by step guide below to quickly install this handle on your stroller. Locate 4 ring halves that are all the same size. They are clearly marked with letters to indicate the size (L, M & S). Put together the pieces to form two full rings. Make sure that the peg on one half is all the way inserted into the hole on the other half. Place a rubber band around the assembled rings so that it is resting in the notches, and it holds the rings together. Installation requires only two rubber bands. A third one is provided as a spare. Use the Ring Location Guide to place the 2 rings around the stroller handle. Each ring should be the same distance from the center point of the stroller handle so that the Easy Stroll is centered when you are finished. Open one side of the ring, and place it around the handle, allowing it to close. The rubber band will hold it in place. Press the ring halves together. If they almost touch and the rings have a firm grip on the handle, it is a good fit. If the ring halves easily touch and the rings can rotate around the stroller manufactuer’s handle grip they are too big – try a smaller size. If thering halves aren’t close to touching, they are too small – try a larger size. Make sure the rings are equal distances from the center point of the stroller manufacturer’s handle. Guide the “hook” ends of the Easy Stroll™ handle into the grooves on the rings making sure the pegs are lined up with the holes. Place the wedge pieces in the open end of the hook. Insert the two screws and tighten using a Phillips screw driver. Rotate the Easy Stroll™ handle up and down to make sure the motion is smooth. If it is not smooth and there are large gaps between the rings halves, remove the Easy Stroll™ Handle and try a larger ring size. The rings should stay in place and the Easy Stroll should revolve around the rings. If the rings are rotating around the stroller's existing handle grip, the ring size is too big. Remove the Easy Stroll and use a smaller ring size. Now that you have completed installation, it is time to Easy Stroll! -- Here’s how: Simply reach in and grab the hand grip as above. With Easy Stroll™, there is little need to use arm or back strength when pushing your stroller. Simply change the direction you’re walking and the stroller will effortlessly change directions with you. You do not really turn or push with your arm, rather you just walk normally and use the position of your body to steeer your stroller. To turn the stroller to the right, walk slightly to the left. The leverage of your entire body will easily turn the stroller to the right. Some of the control still comes from your arm, but most of the control comes from moving your feet. (Hint: the most common mistake made when using Easy Stroll™ is trying to control it with your arm. Steer with your feet, not your arms). After a short period of time, operation of the stroller will become quite easy, and almost like second nature. At this point, strolling will never be the same because you will have discovered the joy of Easy Strolling.. Your free hand can swing naturally as it would while walking without a stroller or used for other tasks, such as holding hands with another child, carrying a bag of groceries, walking the dog, etc. In addition to freeing up a hand, Easy Stroll™ is a more natural and comfortable way of pushing a stroller, which in turn reduces stress on your shoulders and back.